Employees and customers at Mike Shopping Mall rolled up their sleeves to donate blood to the Thai Red Cross. Mike Group Executive Director Surat Mekavarakul invited Queen Sawang Wattana Hospital’s Suyada Jirathanya, head of the blood donations department and liaison to the Thai Red Cross, to take donations all day May 19. 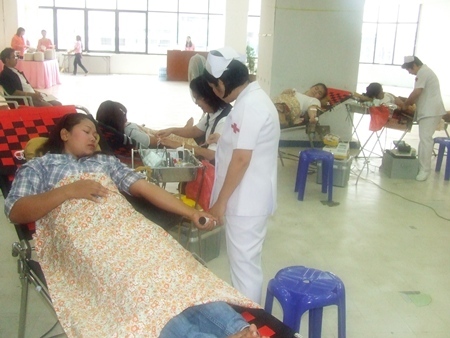 Employees and customers at Mike Shopping Mall roll up their sleeves to donate blood to the Thai Red Cross. Surat said Mike Shopping Mall has worked continuously throughout its 20-year history to support public causes and refilling local blood banks was a pressing concern.